An authentic western vacation for all ages is what the Bar W Guest Ranch is all about. The Bar W on Spencer Lake in Whitefish is a year-round ranch ready to treat you with true western Montana hospitality – from the moment you arrive until long after the sun sets. Nestled between two pine-covered ridges at the base of Spencer Mountain, the Bar W Ranch offers over three thousand beautiful acres for horseback riding and outdoor activities. The Bar W has blended elegance with western informality to create an atmosphere that is relaxing and comfortable after a long day in the saddle. Our well appointed lodge, cabin suites, and Glamping tents, coupled with our world famous western hospitality, make every guest feel at home. 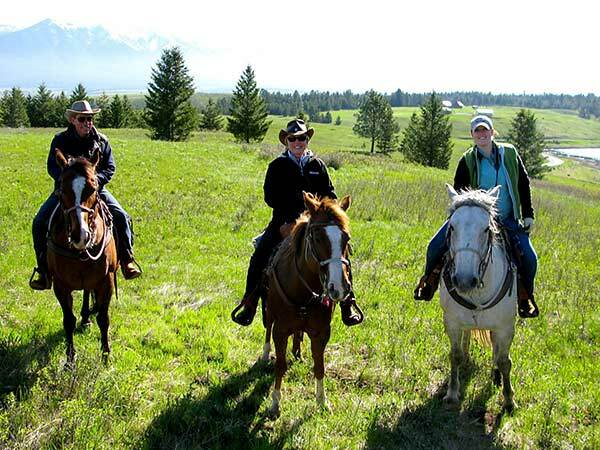 The Ranch consists of indoor and outdoor horseback riding arenas, stables, a barn, play meadow, a lakeside gazebo, and Glacier View Ridge where guests can see the peaks of Glacier National Park. Guests feel miles away from civilization on the Ranch, and many find it hard to believe they are just 3.5 miles from Whitefish, one of the most vibrant towns in Montana. Whitefish was named one of the “Top Ten Cool Towns” by Frommer’s Budget Travel. Enjoy the finest in shopping, dining, theater, and nightlife right down the road from the ranch. If that is not enough, the Flathead Valley is a year-round playground for people of all ages, with whitewater rafting, fishing, nine world-class golf courses, boating, hot air ballooning, downhill and backcountry skiing, cross country ski trails, snowmobiling, dog sledding, and more. Glacier National Park is 23 miles from our family dude ranch, and the drive there is almost as pretty as the Park itself. The Bar W is here for visitors to enjoy “The Montana Experience.” It’s a place to feel at home, a place to discover, and a place to enjoy family and friends. The Bar W Guest Ranch is easy to find, but hard to leave. Visit the Bar W – where guests come as strangers and leave as family.